Sylvia is a new townhouse development by Woodbridge Homes currently under construction at 12073 62 Avenue, Surrey. This is not an offering for sale. E.&O.E. A boutique community of 22 townhomes nestled in sunny South Surrey’s most private neighbourhood. You’ll love the privacy these spacious 3 and 4 bedroom homes offer as they are surrounded by nature and overlooking Peace Portal Golf Course. Room-to-room, floor-to-ceiling, and inside-and-out, every detail of FAIRWAYS is intentionally chosen to make your home the most comfortable, liveable, and intelligently designed that it can be. A seamless blend of classic and contemporary design elements coupled with the warmth of brick and shingle cladding gives FAIRWAYS its timeless appeal. These family-sized townhomes feature foyers and expansive open-concept living spaces as well as chef-inspired kitchens with large islands perfect for entertaining. Wide-plank floors, modern shaker-style cabinetry, quartz surfacing, pendant light fixtures and luxe bathrooms are just some of the design elements you’ll find at FAIRWAYS. It is said that the heart of every home is the kitchen, and FAIRWAYS is no exception. Choose between popular white classic shaker or trendy grey. FAIRWAYS kitchens feature sleek stainless steel appliances, 5 Burner Gas Cook Tops and quartz countertops and solid slab backsplash. Spend warm summer nights entertaining with ease in the spacious backyard or move things indoor in the cooler seasons to the media room. Inspired by the natural forms of ancient old-growth forests and rugged rocky coastlines, the townhomes at Marca are undeniably West Coast in design. Constructed of only the finest materials, these three-storey residences feature warm exterior finishes like cedar wood and natural stone. The bright and warm interiors of these 3 to 4-bedroom homes are spread out over 1,440 sq ft – 2,000 sq ft of functional space, ideal for a growing family. Modern Rooftop Homes – Bright and spacious, these 2 bedroom + den or 3 bedroom + den homes range in size from 1,136 to 1,580 square feet. Executive Townhomes – These executive townhomes have 3 bedroom + den floor plans ranging from 1,403 to 1,461 square feet. TWO SHOW HOMES NOW OPEN DAILY 12-5PM! Edgewood Estates is a premium collection of luxury single family homes located at 21st Avenue and Edgewood Drive in South Surrey. All homes will feature over 3,100 sq.ft.+ of beautifully appointed living space, gourmet kitchens, two car garages and high-end ‘Platinum Collection’ finishes which can be fully customized in our Foxridge Design Centre. These deluxe 5 and 6 bedroom homes are perfectly located with amenities and services just around the corner including Grandview Heights Aquatic Centre, Grandview Corners shopping centre, The Shops at Morgan Crossing, and the new Grandview Heights elementary school directly across the street which is set to open in 2020. To be among the first to receive news and updates on Edgewood Estates, register today! Edgewood Gate is a lovely pocket of new 4 and 5 bedroom single family homes (and a limited number of non-strata attached single family homes) nestled in a serene country-like neighbourhood along 166th Street and 21st Avenue in South Surrey. These contemporary single family homes with legal one bedroom basement suites feature over 2,360+ sq.ft. of smart open concept layouts, detached two car garages plus parking pad, and lush green boulevards surrounding the community, which adds to the country-like charm. All homes boast a chef-inspired kitchen with stainless steel appliances, rear covered patio for summer barbeques, and a large games/recreation room, bedroom, and bathroom on the lower floor. Homes at Edgewood Gate are perfectly situated for those who enjoy the peace and quiet of South Surrey, while being only minutes away from the hustle and bustle of The Shops at Morgan Crossing and Grandview Corners, family-friendly Grandview Aquatics Centre, top ranked Southridge Private School, and a short drive to Crescent Beach, White Rock Pier, and the US border. Located in the Orchard Grove neighbourhood in South Surrey, StreetSide is currently working on the design and development of this new townhouse community. These 80 strata townhomes will be contemporary in architectural design, feature private yards, 3 bedroom layouts, and a community greenspace and amenity building. Tucked away on 25th Avenue and 164th Street in the up-and-coming Grandview Heights neighbourhood in South Surrey is a charming community of new 4 bedroom single family homes (and a handful of non-strata attached single family homes) called Plateau at Grandview Heights. These efficiently designed detached homes complete with finished basements and detached two car garages (plus parking pad) are built to last. Each home boasts over 2,670+ sq.ft. of light-filled interiors including a gourmet kitchen with stainless steel appliances, large games/recreation room on the lower level, and ‘Signature Collection’ finishes throughout. The finished basement in many homes can also be converted into a legal secondary suite – just one of many optional upgrades available in our on-site Foxridge Design Centre where homeowners can personalize their space by selecting their colours, materials and finishes. Located in the picturesque Grandview Heights neighbourhood, residents are minutes away from top ranked schools (Southridge Private School) and the best of urban conveniences including golf courses, restaurants, Grandview Corners and The Shops at Morgan Crossing, and the award-winning Grandview Heights Aquatic Centre. With so much, so close to home, you might just decide to ditch the car and use your garage as an art studio, or a home theatre room. SW/TCH offers you the ultimate launch pad to be wherever you want, whenever you want. And with your SW/TCH home being NEST enabled, you can rest assured your home is safe and secure at all times. Get ready to live a life of comfort and convenience at SW/TCH. and even has a pond too! huge outdoor terrace on upper level. for entertaining guests and hosting parties. •Interiors lit by high-end pot lights. floors, stairs, hallways and flex rooms. porcelain tiles in master ensuite. the trails along Crescent Beach. •Dazzling solid surface quartz countertops. –perfect for dining and entertaining. •Pendant lighting above kitchen island. •Gas barbecue hook-up for easy cooking. •Cat5 wiring for internet, phone and TV. •Smoke detectors on each floor. •JENN-AIR® 30″ 5-Burner Gas Cooktop. 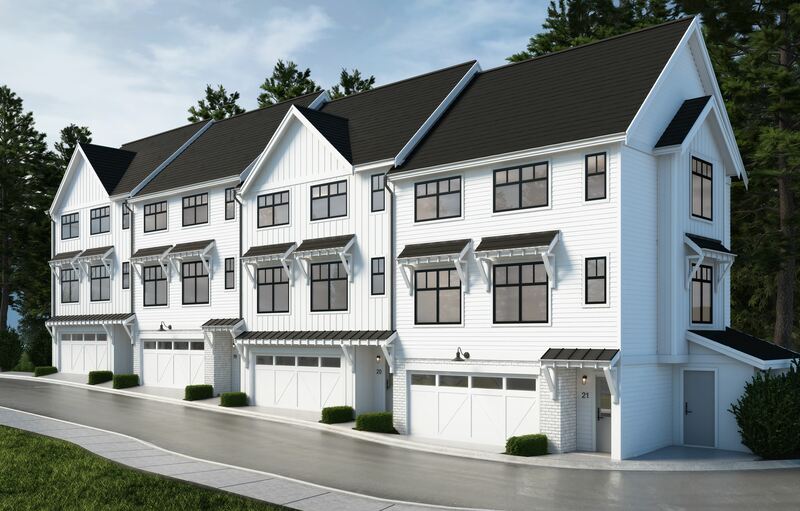 Introducing DAWSON’S CREEK, a collection of 3 + 4 bedroom townhomes nestled on a salmon bearing creek in an ideal Surrey location. Some of the key features include: Shingle style architecture, side-by-side parking, dual his and hers sinks, and main floor powder rooms. Centrally located on major transit + commuter routes in the Lower Mainland. Homes are expected to complete in 2018. Introducing OLD SCHOOL, a collection of townhomes situated in an ideal South Surrey location. Homes are entertainment sized and the well-appointed kitchens come standard with imported quartz countertops, under cabinet task lighting, gas range and an under-mount sink. Within walking distance to everything and centrally located on major transit + commuter routes in the Lower Mainland. Homes ready for move-in Summer 2018. From a terraced hillside perch, 57 luxurious townhomes overlook verdant country fields and the serene Nicomekl River. This picturesque pocket community in South Surrey’s upscale Rosemary Heights neighbourhood is the perfect companion to the boutique collection of West Coast-inspired homes. With views extending to the mountains and walking trails weaving through mature trees, living at Viridian is a refreshing experience like no other. Award-winning Portrait Homes designed and built the townhomes with an emphasis on quality and craftsmanship. The two-, three-, and four-bedroom homes (including some master-on-the-main) embrace space with over 2,000 square feet of living. An open concept design is beautifully appointed with elegant details and finishes. Featuring covered outdoor decks, space for entertaining, and double-car garages, townhomes feel like a single-family home, with the convenience of a lock-and-leave lifestyle. With townhomes starting from $899,900, move into your luxury residence this Spring and live a life that’s truly remarkable. Featuring 2 Floor Plans both the Arbour and Birch Series offers 4 bedrooms. Plans range from 2822 SQ. FT. to 2852 SQ. FT. Within walking distance from Morgan Crossing and Grandview Corners discover a neighbourhood that offers an abundance of fresh sights, activities and amenities. Enjoy sashimi at Sushi Castle, or a modern Indian dish at Vij’s, My Shanti. Shop for a good book at Indigo, a new outfit at H&M or furniture at Restoration Hardware all while enjoying a latte from Starbucks. Head outdoors and take a stroll on thepier at White Rock Beach or bike the trails of the Sunnyside urban forest. Then pick up a few groceries at Thrifty’s Foods on your way back. Orchard Grove puts you at the centre of a vibrant urban enclave. Impeccable interiors showcase airy 10-foot ceilings and large windows that immerse open spaces with natural light. The gourmet kitchen is the heart of your home equipped with a premium Fisher Paykel appliance packages including professional 36” gas range, double drawer dishwasher, French door refrigerator, rich quartz counters and oversized island. Bright, open spaces and modern features are flexible by design— make them your own. Each Southcrest home is thoughtfully designed to maximize light and comfort on each of its three floors. Oversized windows, soaring 10-foot ceilings and open-concept plans create a comfortably spacious atmosphere ideal for entertaining. Upstairs, the spacious master bedroom features a vaulted ceiling, dual walk-in closets, and an ensuite with a free-standing soaker tub and glass-enclosed shower. Make it a space that works for your family. Bordered by lush landscaped greens on the East, the Nicomekl River on the North and minutes away from Crescent Beach, Crescendo seamlessly blends 66 luxury townhomes with the pristine surroundings of one of the last remaining river fronting properties being developed in South Surrey. Hawthorne feels like a small town main street, in the heart of a big city. Everything you need, from all the places you love, where everybody will know your name. And when it’s time to travel, quick access to all the main thoroughfares. Spacious 3 bedroom floorplans provide flexibility to match the way you live. Interiors are professionally planned to make the most efficient use of space and storage. Two designer colour schemes are available – White or Oak – and offer a refined neutral backdrop for your colour inspiration. Nine-foot ceilings on the main floor make spaces feel open and airy. Wide-plank laminate wood flooring throughout the entryways and main living areas gives way to plush resilient carpeting in upper halls, stairs and bedrooms. Windows are expansive and energy efficient with two inch horizontal blinds to offer privacy and light control. Blackberry is centrally located with easy access to major driving routes such as Hwy 99, Hwy 15 and 152nd Street so access to the Lower Mainland or to the US Border is quick and easy. But everything you’ll need is a much shorter trip away. Whether it’s a grocery store, café, restaurant community centre or schools, it’s a quick and easy trip from Blackberry.